Just logging in. I thought Force India was going skip this session? @RayRamirez: Force India is here with the 2014 car this week. The 2015 car should make its debut next week. Alonso sets a new PB - 1:25.961 on the soft tyres. This looks like something of a resurgence for Red Bull with 84 laps and counting today. It's their most in a single day this year after registering just 166 in Jerez. With a time at 1:24.574 the car is no slouch either. That's faster than the best time in the in-season test here last year. Hamilton and Ricciardo look like they're on long runs or potential race simulations out there. Hamilton's now up to 24 laps. Hamilton lapping in the low 1:31s, which is not too dissimilar to Ricciardo's current pace. But as ever, we have no idea about fuel loads. Alonso into nearly uncharted territory for McLaren - he's just started his SIXTH lap in a row. I've been wanting to ask someone inside F1 this... but ESPN has to be the next best thing i suppose. ;) Hamilton has the quali lap record on Silverstone with 1:29.607. Given an F1 factory with "unlimited" resources and no regulations to follow. What could theoretically be a lap time from a fantasy car? @RitchieRich: I'm sorry to say I have no idea! The limiting factor would probably be the driver behind the wheel rather than current race technology. If anybody has Gran Turismo, do a quick lap in the Red Bull concept car and let us know. Is the last test when we'll give a true indications of each cars potential or will that be saved for Melbourne? @Rodster: A lot of the engineers in F1 refuse to draw conclusions in Melbourne too as it's not really a representative track for the rest of the year. Malaysia is a better test, but the conditions are still quite unusual. Teams often bat away questions until the Spanish Grand Prix back here at the Circuit de Catalunya in May - but at that point it's quite hard to convince everyone you still have a quick car despite it finishing off the podium each weekend. 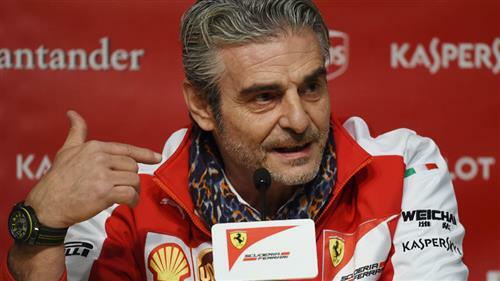 I don't understand why Ferrari is not going for race simulation. Even though last year they had performance related issues, they also had issue with Tyre temperature in races. Aren't they concerned about that? @Anagh: I think we have to trust that the Ferrari engineers know better than any of us what the weak points are and how to fix them. Do you think one test will be enough for force india? @Vikkstar123: Enough to race? Sure. Enough to race to the best of the car's ability in Melbourne? No. Are both Hamilton and Rosberg doing laps in the Mercedes today? @TPH: Rosberg did the morning session and Hamilton is out this afternoon. These Manor/Marussia machinations make no sense. If F1 wants them around, shouldn't CVC just write them a cheque for a no interest loan that only has to be paid back out of future prize money? Running around in a 2014 chassis with 2014 engines? What's the point other than coming last? @mfbull: CVC only writes cheques it is contractually obliged to write. Early days yet. But a lot more promising from the ALO-McL package this time around. Is there still a limit on fuel flow rate in testing? Regarding Red Bull concept car - Vettel shortened the laptime on Suzuka by 20 seconds... not sure how that translates to Silverstone, but the improvement would be massive in any case. @Laurence: Hmmmmm...like a Force India maybe? @mfbull: False. I heard similar rumours, but they were coupled with suggestions McLaren would go orange. Hamilton heads back out on track, I presume to continue his race simulation. Yeah, I've always rated Andrew Green highly but I think because Force India tends to fall away every year as the season goes on, he gets less credit than he's due. 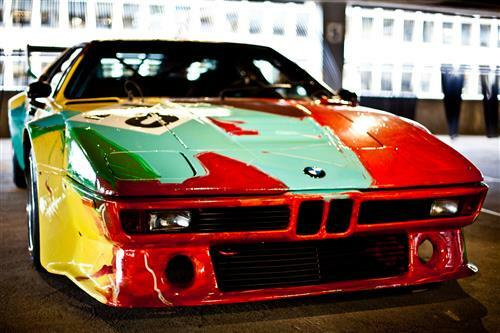 Just quickly while we are on the subject of car liveries, here is my favourite. Not F1 but 1 point and a bonus question to anyone who can name the man who came up with it. @Prithvi. Working myself in a design environment, I have doubt that Adrian Newey even touch the design of it. He drive every ideas, but so much things have to be coherent between the engine environment, the aero, and suspensions, and transmission, etc, etc. It always depends of the quantity and quality of the staff designers, like an orchestra with a master if you want..
@MIKEB: That's a very good point. Strictly speaking we are discussing more about technical directors than designers and you are right to say that is more of managerial role at times. @mfbull: We have a winner! Now, mfbull, for two points (worth nothing in the real world) can you name the artist behind this more recent BMW "art car"? Right, back to F1, Perez, Alonso and Massa are on track. Alonso on the soft, Massa on the winter hard and Perez on the medium. 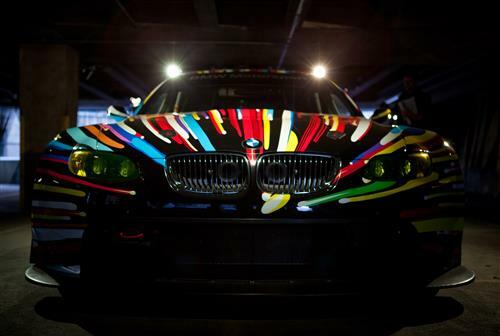 Alas, the game of "Name the artist of the BMW Art Car" comes to an end for another year. However, if you ever get a chance to see them, I fully recommend it. @Dhruv: To start with, don't look at the fastest times. The best place to start to understand them is by looking at longer runs. We might get Nate to do some number crunching later in the week when we have a few race-length runs to compare.